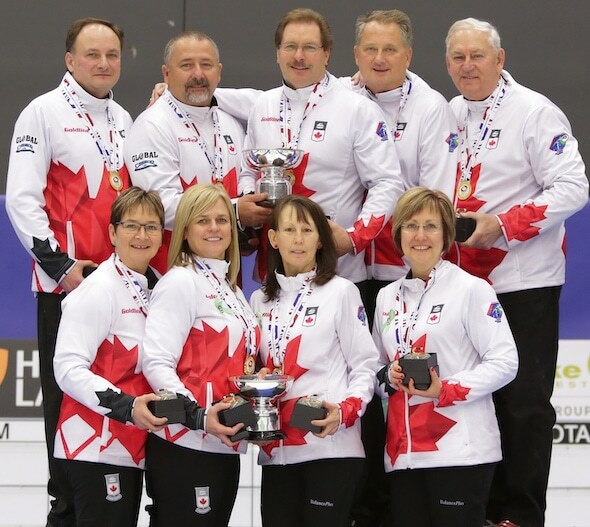 All Posts / Our Championships / 2019 Everest Canadian Seniors underway Friday in Chilliwack, B.C. Fourteen men’s and 14 women’s teams (representing the 10 provinces plus Northern Ontario, Northwest Territories, Nunavut and Yukon) will compete, and have been seeded into two pools per gender, based on last year’s results, and will first play a round robin within their pool through Monday. The top four in each pool then advance to the Championship Pool for games against teams from the other pool, while the remaining teams go to the Seeding Pool. At the conclusion of the Championship Pool on Wednesday, the semifinals will be held Thursday, March 28, at 8:30 a.m. (all times Pacific), pairing 1 vs. 4 and 2 vs. 3. The winners then advance to their respective gold-medal final later in the day while the losers will play for bronze. The men’s bronze- and gold-medal games are at 12:30 p.m., followed by the women’s medal games at 3:30 p.m. Both defending champions — Ontario’s Bryan Cochrane (Russell; also the 2016 champion) and Saskatchewan’s Sherry Anderson (Saskatoon; also won in 2017 and is going for a three-peat in Chilliwack) — are in the field. But they’ll be pushed hard by a field that includes an Olympic medallist (Alberta’s Glenys Bakker of Calgary, who played second for Shannon Kleibrink’s Canadian bronze-medal women’s team in 2006 at Torino, Italy), a two-time world men’s champ (Northern Ontario’s Al Hackner [Thunder Bay] in 1982 and 1985), three Tim Hortons Brier champions (Hackner, and Quebec men’s skip François Roberge and second Maxime Elmaleh [Etchemin/Kenogami/Lacolle], who were members of Jean-Michel Ménard’s 2006 Canadian champs and world silver-medallists), a world women’s champ (Ontario women’s lead Jane Hooper-Perroud, who was a member of Marilyn Bodogh’s 1996 Scotties and world championship team; now playing for Sherry Middaugh [Thornhill]), not to mention both reigning world senior champions — Anderson on the women’s side and Alberta’s Wade White (Edmonton) on the men’s side. 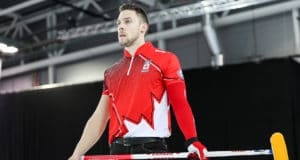 Skipping the host-province entries will be Wes Craig on the men’s side, representing the Nanaimo and Kerry Park curling clubs, and Marilou Richter on the women’s side, representing the Penticton and Kelowna curling clubs. The men’s field is rounded out by Manitoba’s Dave Boehmer (Petersfield), New Brunswick’s Wade Blanchard (Saint John), Newfoundland/Labrador’s Gary Oke (Corner Brook), Glen Hudy of the Northwest Territories (Yellowknife), Nova Scotia’s Brent MacDougall (Halifax/Dartmouth), Nunavut’s Peter Mackey (Iqaluit), Phil Gorveatt of Prince Edward Island (Charlottetown/Montague), Saskatchewan’s Bruce Korte (Saskatoon), and the Yukon’s Pat Paslawski (Whitehorse). Completing the women’s field are Manitoba’s Terry Ursel (Arden), New Brunswick’s Judy Ross (Fredericton), Newfoundland/Labrador’s Diane Roberts (St. John’s), Northern Ontario’s Kim Beaudry (Fort Frances), Sharon Cormier of the Northwest Territories (Yellowknife), Nova Scotia’s Nancy McConnery (Bridgewater/Glooscap/Lakeshore), Nunavut’s Geneva Chislett (Iqaluit), P.E.I.’s Kim Aylward (Summerside), Quebec’s Odette Trudel (Trois-Rivières), and the Yukon’s Rhonda Horte (Whitehorse). The Canadian Senior Men’s Championship began in 1965 at Port Arthur, Ont. Since then, Manitoba has won a leading 12 titles, Ontario is next with 11 while Alberta has 10. The Canadian Senior Women’s Championship began in 1973 at Ottawa. Ontario has won a leading 10 crowns, followed by Saskatchewan and British Columbia with eight apiece, and Alberta with seven. The last B.C. women’s team to win was skipped by Christine Jurgenson in 2010 at Ottawa. It’s been a longer dry-spell on the men’s side, going back to 1999 when Ken Watson’s B.C. team prevailed at Saskatoon. 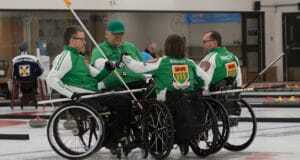 The championships were conducted separately until being combined in 1985 at Yorkton, Sask. It will be the fourth time the Canadian Seniors have been staged in British Columbia since the men’s and women’s events were combined. This year’s winners will represent Canada in the 2020 World Seniors, at a site and date to be announced by the World Curling Federation. The World Seniors officially began in 2002. Canada has won a leading 10 men’s and 12 women’s titles. Since 2005, the winners of the Canadian Seniors have represented Canada in the following year’s World Seniors. Thus, last year’s winners — Cochrane and Anderson — will wear the Maple Leaf in the 2019 World Seniors, April 20-27 at Stavanger, Norway. This is the fifth year of title sponsorship by Everest, the first nationwide funeral planning and concierge service.